Oregon’s a great travel destination: ocean beaches, mountains, forests, wildlife, waterfalls, hiking, camping, and more. When it comes to Oregon’s cities, Portland gets most of the travel buzz. But nestled into the foothills of the Siskiyou Mountains just north of the California border, the historic and picturesque city of Ashland is another great Oregon destination. Ashland, the home of Southern Oregon University and the Oregon Shakespeare Festival, has a walkable downtown that’s chock full of cafes, chocolatiers, restaurants, shops, and gorgeous Lithia Park. 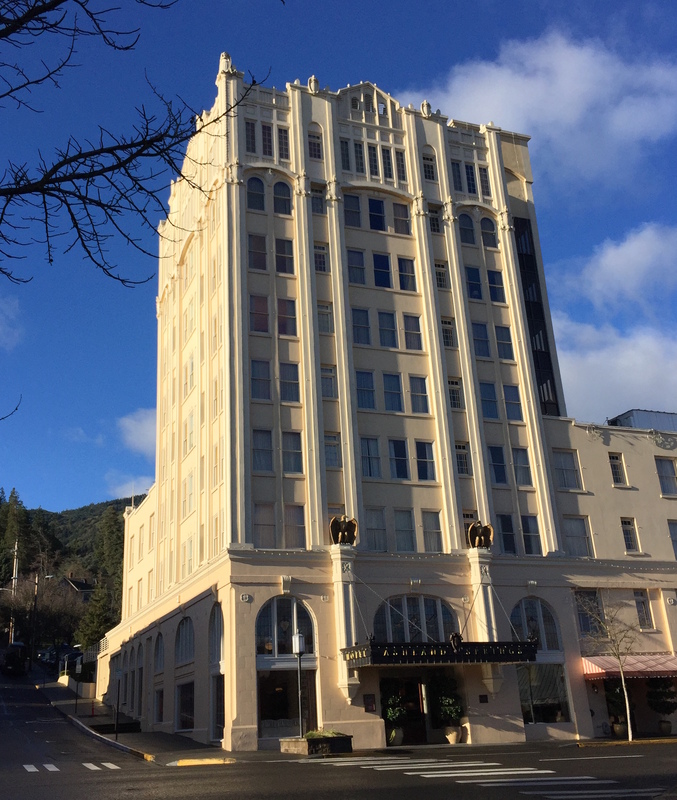 We spent a Presidents Day weekend in Ashland, and our stay at the historic Ashland Springs Hotel — right in the heart of downtown Ashland — was outstanding. The hotel was originally built in 1925, and all its original architectural touches have been beautifully restored. Listed on the National Register of Historic Places, it’s a gorgeous building inside and out. When we walked in the door we felt a bit like we’d stepped back in time. The chandelier and balconies were beautiful. The furniture was cozy. Unique bird and shell collections set the period ambience. And the entire lobby was bathed in a beautiful glow from the natural light pouring in its many windows. Our room was small and intimate with big double hung windows that faced the street and, in the distance, rolling hills blanketed with snow. The decor was very tastefully done and again true to period. There was an overstuffed chair with a large lamp perfect for reading, along with a small desk. 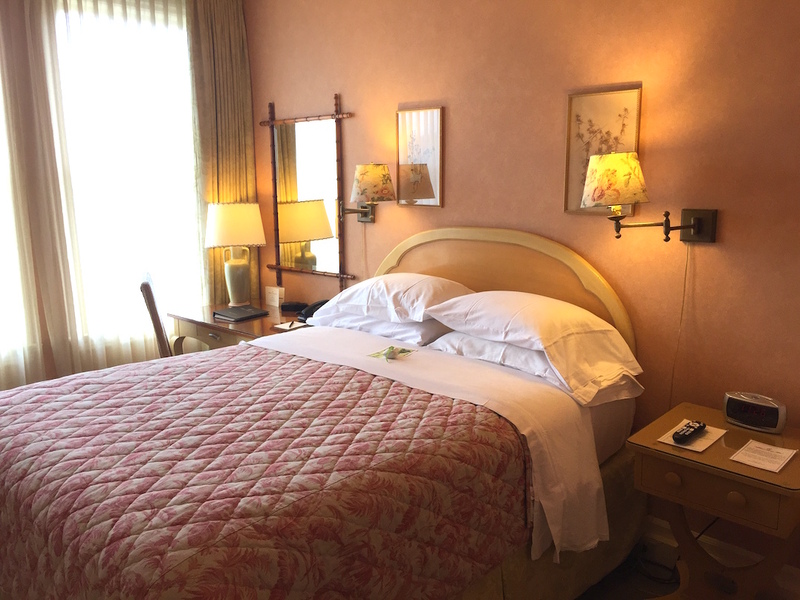 The queen bed — with its down blankets and pillows — was extremely comfortable. Other amenities included a charging station, cotton robes, iron, coffee maker, hair dryer, alarm clock, TV, and small en suite bathroom with shower. Included in our stay were both afternoon tea in the hotel lobby balcony — get there early if you want baked goods — as well as a fantastic expanded continental breakfast. A 10% discount coupon for brunch at their neighboring restaurant, Lark’s, was provided when we arrived, but the hotel breakfast was so substantial — including hard-boiled eggs, scrambled eggs with cheese and peppers, potatoes, fruit and yogurt, muffins, breads, and oatmeal — that we didn’t use the coupon! 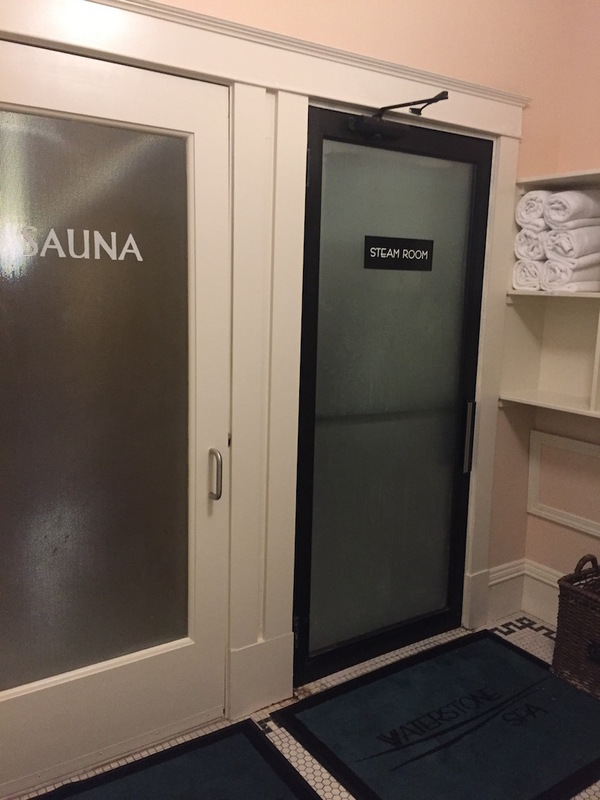 The property is affiliated with the Waterstone Spa, and hotel guests are free to use the spa’s steam room and sauna at no charge. Other services such as massage, facials, foot treatments and the like are also available for a fee. The spa is just a few doors down from the hotel in another beautiful, historic building. Reservations are recommended. The hotel is lovely, and worth a stay just for its beauty, but its fantastic location right in the heart of Ashland, just steps from restaurants, shopping, and the theaters of the Oregon Shakespeare Festival, bring it to another level. From the hotel, we walked to lunch, shops, a pub, a movie theater, Lithia Park, dinner, and to a play — and none of these destinations was more than a ten minute walk. It was so nice to be tourists and not have to deal with driving and finding parking downtown. Staying at the Ashland Springs allowed us to simply park our car (free parking in a gated lot is included) and spend the rest of our weekend exploring Ashland on foot. Although staying here may be a bit of a splurge for budget travelers, its ideal location, complimentary amenities, and available packages make it a very good value. If you’re considering a visit to Ashland, we’d definitely recommend a stay at the Ashland Springs Hotel. Do you have a favorite hotel with a fabulous location or ambience? Share it with us in the comments. And enjoy your next hotel stay, whether it’s for a week or a weekend! This post was sponsored by the nice folks at the Neuman Hotel Group, but all opinions are our own. Erin – Years ago I heard that the Coleman family (of Coleman stoves) lives in Ashland and restored this hotel. Obviously it has been turned over to a hotel group but the fauna and flora theme is (I believe) from the collection of the Coleman family. I recall my first visit to Ashland in 1980 – the hotel was in disrepair and called the Mark Anthony. So nice to see it all spoofed up!